My (I think) 1961 Super Rocket came with one of these replacement VIN tags from Pennsylvania. It also has had the engine number scratched off, presumably for the same reason the special plate was issued. Has anyone else run into this and have any insight? I would like to know the bikes real history and figure out if it's a Bitsa or what. Where an engine number is removed, it is always highly suspicious. It's just possible that etching could reveal the original number impressions. A job for a professional. Is the original frame number under the replacement which appears to be suspiciously blank? I'd say that it was stolen and recovered or seized by the cops at some stage. Down here in such a case the police or Roads & Traffic Authority give you new numbers to stamp on. As to finding it's history with no numbers not vert likely. ...which appears to be suspiciously blank? I think the number has been blanked for the photo, for security reasons. Grey beard is correct. I blurred the numbers on the photo. The theft seems to make the most sense. I’m not too worried about the frame numbers, but missing the engine numbers is a bit annoying. I have emailed the Pennsylvania Dept of Transportation to see if they can tell me more. I read that they could even give me the original VIN, which would tell me a lot. I found someone in a car forum suggest calling the PA Dept of Transportation and talking to them. They suggested I fill out a form requesting information (and pay a small fee, of course) and send them any information I have. I guess we'll see why it was issued that special plate and why anyone would rub the engine markings off. I do actually enjoy this information finding part! The Stolen Vehicle Squad at Chalk Farm ( Met ) used heat on the engine blocks which shows the engine number deep down even after it has been ground back. Cannot remember how long the PNC lists them as LOS, probably indefinitely. Sounds very stolen, sorry. Might be different across the pond. Regards. Interesting process with the heat. I wonder if I can find someone locally-ish to me that could do that. It must have been stolen, wrecked, or something many years ago because the VIN plate looks older. I did find what I believe is the frame number: GA7-19890, so that would make it either a Golden Flash, GF alternator, Super Rocket, or various A7 models from 1960 - 1963. I'll have to research any differences in the Super Rocket frames to the others. Plates like that are not unusual and have seen many of them, none from that state, but I have inspected many and had some myself. I traded a frame with an Oregon assigned VIN with a special sticker to a local guy in exchange for some money and repairs to one of my other frames. The rules vary from state to state and DMV employees interpretation of the rules. One of my consistent complaints is that the DMV-Regional govt seems to refuse to hire people with actual motor vehicle knowledge, skills and training. I am NOT exaggerating! I have actually applied for some of these jobs when I was still working for govt agencies. I did not fit the quota hire criteria. I have a million stories about DMV experiences. One of my favorites is a shop customer who grew up in Mexico city while his parents worked down there. He speaks fluent spanish and several other languages so was a priority hire. But John is very obstinate about rules and regulations and actually very intelligent. Without going into a long rant about immigration, In short, he refused to follow directions for licensing people with phony documents. At one point a FBI agent came and spoke to him and told him "We dont care, we just want a picture and a name" This was pre 9/11 and the tune has changed but eventually they forced him out of the job because he refused to compromise. I have worked in shops that have replaced cases and frames, and we did ours legally and did all the notifications and paperwork for replacements, but I stamped a number of frames and cases for legitimate circumstances. In doing vintage restorations I also did some as well and issued Notarized documents to the DMV and owner stating "Due to catastrophic engine failure I scrapped engine case # XXXXXX and replaced it with a service replacement case with existing VIN # XXXXXXX" as well as a few cases where we used NOS no numbers frames and cases. I have a couple Triumphs, both pre raised pad and post raised pad with no numbers, These are dealer replacement cases, Ill snap a pix of one. This one came from a Washington state shop, and No one in WaDot can tell me WHY they had the Washington state outline stamp on the cases, but apparently someone had a bright idea at one time, but no one I spoke to has any idea of what that was or why. I am perplexed on what to do with it, because at this point it will just confuse any inspection. This mouth breathing idiot promptly pronounced ALL my bikes as likely stolen and al;tered VIN Numbers,, I showed him the books and he gave me the "Watchyoutalkinboutwillis look" But that was a huge waste of time. He informed me with great satisfaction that he had just attended training on how to spot stolen Harleys,,, I laughed at him and said "I hope you didnt pay much because you dont know what the hell you are talking about" I have offered to do training for local LE and DMV staff on how to spot, interpret and ID British motorcycles but got no response. Pro tip: Most have no idea WHAT a vintage VIN looks like,, Some of my Goldstars have 3 digits, I sold a 63 Triumph also with 3 digits and WaDot pronounced it as altered and likely stolen. So, the fix is tell them to add 14 zeros either in front or back of the VIN number. This placates them as they dont understand what anything other than a 17 digit vin looks like. The VIN plate on my 39 Plymouth coupe is a cow tag screwed to the frame. The VIN plate for my Datsun Pickup is held on with 4 screws, easy to swap. A Police officer during a traffic check, or at some large biker events such as Sturgis or Daytona will do VIN checks. It is legal for an officer in THEIR opinion that if a vin # appears altered they can seize the vehicle and place in impound. Then you have to go to court to prove otherwise (Prove a negative in many cases). I have heard of vehicles held for several years with lengthy court fights (Several of these documented in articles in Thunder press) This generally applies to HD owners and members of 1% clubs, but its not hard to get snared in the same net. I have NEVER been pulled over in a car and had VIN inspections, and I have never had it happen on a stock british bike, But I HAVE had it happen on customs and especially choppers. But dont rule out a overzealous Barney Fife or Jackie Gleason.........( Crossing the Canadian Border going INTO Canada or INTO the US is equally hap hazard and fraught with idiots) But its not uncommon here locally that police will pull over large groups of bikes for VIN inspections. I have old school grey beard biker friends who are deathly afraid to even have suspect numbers VINs on their property. There is some people selling VIN plates of their own creation on the net,, I would be very careful of using those, conversely,, You can buy NEW Norton VIN plates all day long from any number of vendors. Department of Revenue! How's that for a bit of honesty? We have Vic Roads 'Down Under' and they are just thieves. I have had bikes previously that some moron at the DMV registered and titled it based on the casting numbers found on some frames & 1 with the BIRCO casting number on the cast iron cylinder. THAT was fun to rectify!!! I currently have one down in the shop that the DMV in Washington thought that a components serial number was the VIN, and I am straightening that one out as well. Complicating things is that I live in Oregon and Oregon wont touch these, So I have to straighten it out with WaDot, and its called a TPO, IE: Title Purposes Only, THEN once they sort things out I can take it to Oregon where I live. Here is another conundrum I run into. In Oregon, only double axle trailers get plates and registration, Single axle nada, zip. But to TRAVEL in Washington ALL trailers have to have registration and plates. Currently no one can tell me how to achieve that. Thank you for posting the bulletin, Julian. That gives me the most hope for a "legitimate" outcome. It still seems a bit unlikely, but I guess they wouldn't have released a bulletin if only one or two had the issue. Sluggo, it sounds like you've found yourself neck deep in registration issues; SEVERAL times over. It's never a very fun procedure as there is so much confusion and lack of uniformity between the states and even DMV/BMV offices. I have sent a form to PA requesting further information about the ownership history, serial number history, and any other information they can give me. I only wish they had left the engine numbers intact. I don't intend to sell the bike, but if I did, surely that affects the value quite a bit. Back in the days when Insurance had local agents,, If you had a good agent, they could look up all kinds of stuff for you. One of my renters was a senior staff member for a well known carrier.. I cant/wont say who. But I used her for background checks, history and all kinds of data back in the day. Then When I worked for govt, I had access too to several data systems but you had a log of every query so I had to be careful not to get in trouble,. 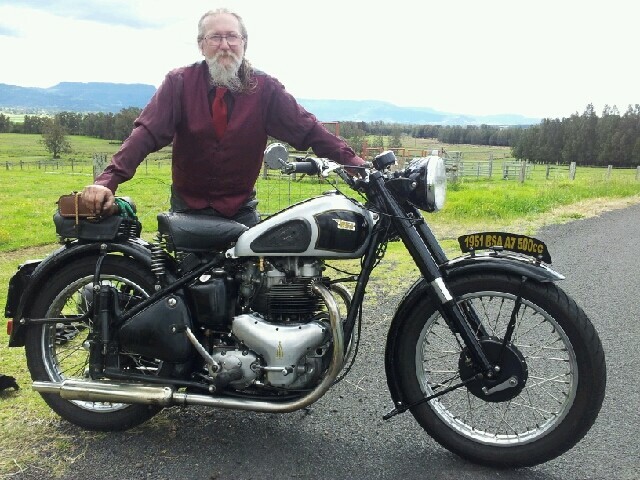 MY boss was an idiot, but not so stupid he would not notice me looking up hordes of Norton, BSA and Triumph numbers. MY FIL is a retired detective,, and many other family and friends same,,, to them,,, EVERYONE is a suspect! The biggest thng is Police CAN impound a vehicle that they suspect (Preponderance of Evidence is the standard) has been altered. Well hell,,,, 90% of British bike VIN numbers look suspect to the untrained eye!